Gordon selected Fort Stedman, an earthen redoubt with a moat and nine-foot walls. Although imposing, Gordon believed it offered the greatest chance for success since it was located just 150 yards from the Confederate lines – the narrowest gap along the entire front. 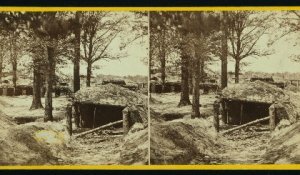 Lee amassed nearly half of his army in an attempt to break through Grant’s Petersburg defenses and threaten his supply depot at City Point. At 4:00 a.m. on the morning of March 25th, 11,000 Rebels overpowered Fort Stedman’s garrisons and Batteries X, XI, and XII. The Confederates were brought under a killing crossfire, and counterattacks led by Maj. Gens. Parke and Hartranft contained the breakthrough, cut off, and captured more than 1,900 of the attackers. During the day, elements of the II and VI Corps assaulted and captured the entrenched picket lines in their respective fronts, which had been weakened for the assault on Fort Stedman. The Rebels were unable to hold the captured ground, and they were driven back to their original position. The attack eventually failed, and within a week Lee evacuated his positions around Petersburg. The Union lost 1,000 men killed, wounded, and captured, while the Lee lost probably three times that number, including 1,500 captured during the retreat. Already outnumbered, these loses were more than Lee’s army could bear. Lee wrote to Confederate President Jefferson Davis that it would be impossible to maintain the Petersburg line much longer. On March 29, Grant began his offensive, and the Confederate Army feel at Five Forks on April 1, and Petersburg fell on April 2-3. Two weeks after the Battle of Fort Stedman, Lee surrendered to Grant at Appomattox Court House in Virginia on April 9, 1865. IMAGE: O’Sullivan, Timothy H., 1840-1882, photographer. Interior of the Union Fort Stedman, Petersburgh, [sic], Va., showing bombproofs. This is a stereograph image created ca.1864-ca.1865, Call Number PR-065-811-44 at the Library of Congress.